Good morning! For those that follow me on instagram, @lesleyzellers, you probably have realized I started Whole 30 this past week. If you're not familiar with the challenge, you can learn about it here. So why did I do it? Good question. There are a few reasons actually. The main one was to get myself back in the kitchen. With deadlines, holidays and just the normal pace of a life with 3 kids, we started eating out way too much. That is neither good for the finances or our health. Some nights it's easier to just go out and get some food with zero meal planning, we know there will be something everyone will like and hello, no dishes to clean up. But we are getting ready to build a house and my husband and I decided this was the kick in the booty we needed to get better at meal planning, eating healthier and getting back to eating at home for every meal and what better time to start than a new year?! I mean, we eat pretty healthy food already so I didn't think it would be SO hard. My husband and I don't drink a lot of pop, we don't eat much fried food, we don't eat a lot of sugary things but we do eat out too much, ejoy a semi-weekly donut, a glass (or 2) of wine with dinner from time to time and I LOVE me some chips, salsa and queso and ALL the cheese. And bread isn't too shabby either. Anyway, a lot of you have asked questions regarding my experience, like are your kids doing it too, where do you find your recipes, what's that Instant Pot thing, what's in that salad?! and a whole bunch of others so I'm going to try to address them here. For starters, my husband and I committed to doing the Whole30 challenge and wanted our kids to do it with us as much as possible without a ton of complaining. So we feed them what we eat but I also make them a side that isn't approved or give them a cookie after dinner. So basically I was not about to make 1 meal for us and a second meal for them - that's just crazy talk. So what would a meal look like for us versus them? One night I made spaghetti squash with meat sauce and a salad with homemade red wine vinegar dressing. I made the kids actual spaghetti because none of them love squash in any variety and they got to choose their favorite dressing for their own salads. They were happy, we were happy, we all won. If we do burgers, they get buns but eat the same sides as us. Breakfast, they get oatmeal or toast with their eggs but they still get the fruit salad. Oh, and they get treats like the occasional cookie or chocolate piece and they drink milk every morning. As for where I find my recipes, here and there. Haha. 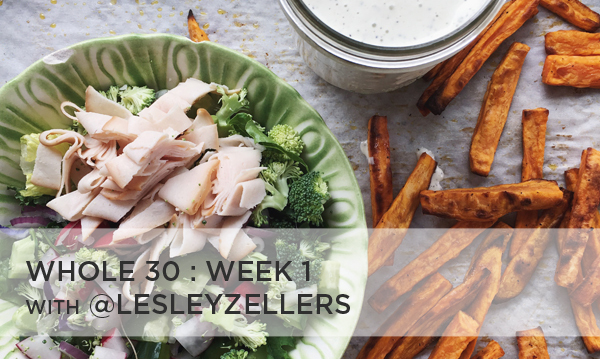 I tried doing Whole30 once before and was so consumed with finding recipes and making meals interesting that it became a burden and complete time zapper. This go around I wanted to keep it simple. Grab the veggies that were on sale at the grocery store and pick up some meats to go with it. A lot of roasted or steamed veggies because those are easy and a lot of salads because I'm a salad junkie. Oh, and the eggs. A LOT of eggs. That said, I did find some easy recipes on pinterest and saved some to my "healthy food" and Instant Pot recipes" boards to reference this month. You can find the boards here. I do love NomNomPaleo and WholeSisters. Oh, and there is a Whole30 cookbook (The Whole30 Cookbook: 150 Delicious and Totally Compliant Recipes to Help You Succeed with the Whole30 and Beyond ) and a Paleo Instant Pot cookbook (Paleo Cooking With Your Instant Pot: 80 Incredible Gluten- and Grain-Free Recipes Made Twice as Delicious in Half the Time ) that I hear have fantastic recipes but I don't have either. If we keep it up another month (yes, we've talked about it) I really want to get the Paleo Instant Pot book. Which brings me to the Instant Pot. This is where I share my new found obsession with a kitchen appliance. What is an Instant Pot? It's an amazing little tool I can not live without now. It's technically an electric pressure cooker but don't let that intimidate you. I have never used a pressure cooker but love my instant pot. For me it's like a super fast crock pot but better. The model I have has a sautee function so you can brown your meat in the same pot you cook it in and it takes like 1/3 or less of the time as a crock pot. 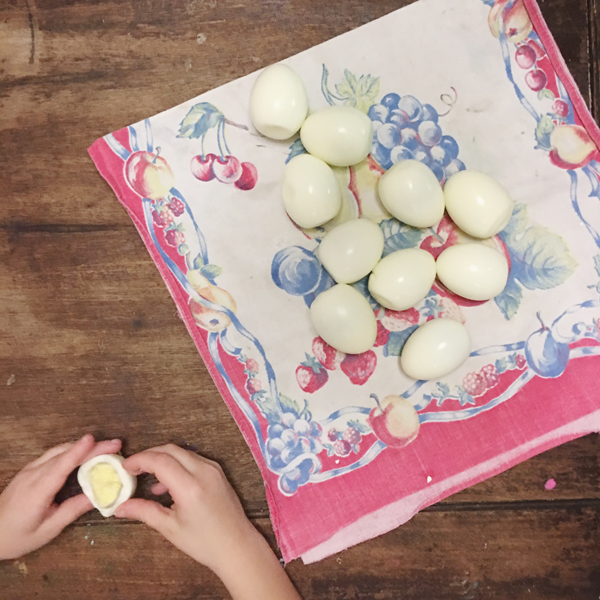 And hard boiled eggs! Well, peeling shells has never been easier! We have made beef pho (not whole30 with the noodles), clam chowder (not whole30 but the best chowder I've ever eaten), eggs, oatmeal (again, not whole30 but goodness, it's so easy and the kids LOVE it), bone broth, stew, kalua pig and I'm sure there's more I can't think of right now - and I've only had it for a couple weeks! It really has been a game changer in our kitchen and although it isn't black Friday, you can still find the model I got on Amazon by clicking on the following link: Instant Pot IP-DUO60 7-in-1 Multi-Functional Pressure Cooker, 6Qt/1000W . So what's in my salad? Instead of sharing each meal on Instagram (that's a whole lot of food pics, y'all) I am going to post them all here with the details. I didn't take pictures but we had bacon, eggs and fruit for breakfast, salad for lunch and grilled cod filets with grilled romaine wedges for dinner. Lunch: taco salad - mixed chopped greens, radishes, onions, ground beef with homemade taco seasoning, homemade guacomole and sugar free salsa, with a drizzle of "dump ranch"
Lunch: grilled chicken salad over mixed greens with radishes, onion, chopped apple, homemade guacamole, a hard boiled egg and some "dump ranch"
Whew. That's a lot of food. I should also mention that I was really bad about skipping breakfast before the challenge. I'd make a latte or even worse, pick one up at Starbucks, and that would be my breakfast. I did a little investigating this week out of curiosity. Did you know there are 35 grams of sugar in a grande vanilla latte? What?! CRAZY! Louisiana Gold red sauce is my BFF. It's not the original sauce. It comes in a little bottle and I've only found it at one store but it's amazing. Great on eggs, salad, burgers and more. and lastly, the Instant Pot is everything. There you go. A freakishly long post about food. If you're doing Whole30 I would LOVE to hear your favorite recipes, sauces or tips to beat the occasional sugar craving. Hi Lesley! I follow you on Instagram and wanted to comment that my family is doing the Whole 30 this month too! We did it last January and the second time around is a bit easier just because everyone knows what to expect! My kids are 7,6, and 3 and they do it right with us. It is very much a team effort. I struggled with kid lunches so much last year. They were just pooped out on salad after a while!!! So I started making these "pancakes" (against the rules but whatever they are kids!) and serving them with a dollop of almond butter and unsweetened applesauce. I put 2 eggs, 1 banana, and 1/4 cup almond flour (per kid) in my Ninja cup and whirl it up. Then fry them up on the griddle with a little coconut oil. If I use the 1/4 cup to measure out the pancake batter, everyone gets the same amount and they are the same size so no fighting.. I know you know what I mean. Ha! I think they taste not so great but after a week on Whole 30 they might as well be made from chocolate cake, my kids devour them. Anyway, wanted to pass along. I pack lunch for big kids but my little one will eat these everyday for lunch. We are just average healthy eaters.. not super awesome or anything. We do this because my oldest is cancer survivor has to have bloodwork every February so we try to get him as healthy as possible before the test. Also let's get real, I eat WAY to may Christmas cookies every December. Looking forward to reading more of your posts! Also I'm going to tell my husband I think we need to move ASAP to a town with a Trader Joes.. geez. That is so awesome that your kids are doing it with you! Way to go!! !And thank you for the recipe, I am going to have to try that. And all the congratulations for your oldest beating cancer! I can't even imagine. That sounds delicious. I'm going to have to make that for sure. Thanks for sharing! Larabars may be your friend. Not all are complaint, but just check ingredients. Helps curb that little sweet fix. Will you share that burger recipe? Looks so good! I found a few I liked. They definitely helped. The burger was just little patties grilled outside. I think my husband just seasoned them with salt & pepper. Then we put some guacamole on each patty, fresh tomato and onion and then topped it with a fried egg. Here are all of my meals from my experience two years ago. Best of luck! 40% off Skillshare Premium Membership Ends Today! Recipe for Crazy is Oklahoma Brand this Week!